Nose: Chilli pepper leads followed by thick set honey, light cloves, cinnamon and gingerbread, extending with creme brulee and vanilla. Palate: Rounded mouthfeel with waves of subtle chilli and paprika piquancy, balanced by the sweetness of thick, set honey with hints of clove and gingerbread. Finish: Chilli leads with luscious honey following, and concluding with gingerbread spicyness. The taste of this distinctive vodka is unforgettable. A subtle infusion of honey and wild herbs creates a smooth and delicately spiced blend which perfectly complements the warmth of the red chilli peppers. 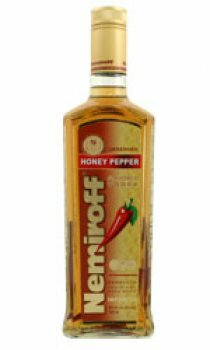 My brother recently returned to the U.S. from a business trip to Russia, and today I got to try the Nemiroff Honey & Pepper vodka he brought home. I tend to prefer higher proof ryes and bourbons, and usually avoid flavoured spirits of any kind, but this was a very compelling experience. There are clove and subtle honey notes mixed with the pepper undertones. I've tasted nothing like it before, and can't wait to get my hands on a bottle for myself!